Visit Perranporth, Cornwall and look beyond the sand and surf to the fascinating history of the Parish of Perranzabuloe. Find out more about this beautiful part of Cornwall by exploring exhibits and curiosities from the past. Enjoy activities for all ages and interact with the museum using games and state of the art technology. What was the Torrey Canyon and what effects did it have on the sea? What famous people came from Perranzabuloe? How did people live their lives one hundred years ago? 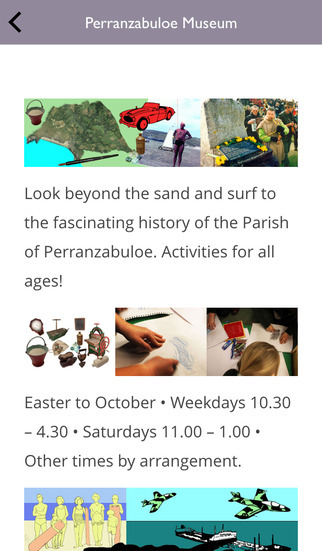 Visit Perranzabuloe Museum and find out more.